Corn hole is one of those ageless backyard games able to entertain everyone, from youngsters to seniors. If you’re new to it though, you might wonder how to play corn hole. What are the game rules and etiquette? Find it out in this article. Similar in many ways to the popular horseshoes game, corn hole is another classic outdoor game that can spice up your summer. Its simple set up and game rules made it popular among tailgaters and beachgoers, but it can also add some liveliness to a backyard party. Like any other backyard game, the rules are flexible and adaptable. But if you want to play by the book and respect all official regulations, you must learn the official rules. Court: Is a rectangular area of 8-10 feet wide and at least 40-45 feet long consisting of two corn hole boards, pitcher’s boxes, and foul lines. Corn hole boards: A rectangular plywood board of approximately 48 by 24 inches with a 6-inch hole with its center positioned at 9 inches from the top and 12 inches from each side of the board. The boards must be positioned slightly inclined with the bottom edge oriented towards the center of the court. Pitcher’s boxes: Two rectangles of 4 by 3 feet at each side of the corn hole boards, where the players sit during the game. Foul lines: Imaginary lines positioned at 27 feet in front of each board and parallel with the front of each board. 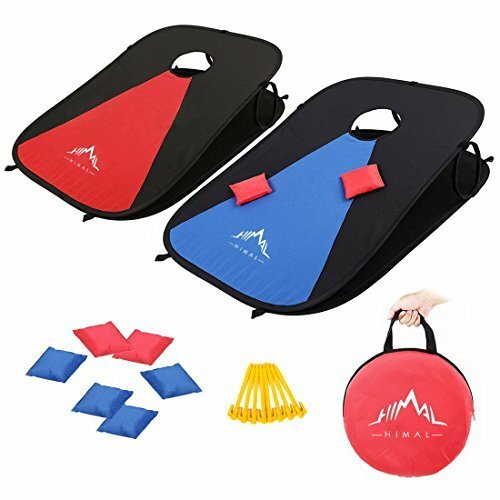 Bags: Eight bags, four of each color, weighing approximately one pound each that players use to toss towards the board hole. According to the official rules, they must be filled with corn feed. Although corn hole can be played either individually or in teams, team play is much more common. A team consists of two players, one positioned in a pitcher’s box next to a board and the other next to the opposite board. The purpose of the game is to achieve 21 or more points before your opponent. Here is how to play it. Like most lawn games, corn hole starts with a coin toss that decides which player goes first. Then, each player lines up in a different pitcher’s box next to the board. Players from the same team must sit on the same side of their board; for instance, if player 1 in team A sits on the right side of a board, player 2 from team A must sit on the right side of the other board, facing the center of the court (diagonal arrangement). Player 1 in each team has all four bags by their side, and the one who won the coin toss starts to pitch the first bag by throwing it towards the opposite board. After the first toss, the first player of the other team tosses their first bag, and the teams alternate turns until each player has tossed all four bags. The round is over after the assignment of the points, then the game reverses, and the players sitting next to the second board get their turn to toss the bags towards the first board as described above, with the team who scored the most points starting the next round. To award the points, just sum up everything. For instance, if one bag is on the ground, two are on the board, and one is in the hole, you’ll score 5 points. If the other team has two bags on the ground, two in the hole and one on the board, it scores 7 points and wins the round. The team that manages to gather 21 points first wins the game. It is common to play at least three games before declaring a definitive winner. If one team manages to score 11 points before the other scores any, the game is called a skunk, and the losing team is disqualified from all other games. Corn hole is a rather rustic game that allows laughing, yelling, and loud talking. However, you shouldn’t distract your opponent when they are tossing the bag nor move any of the bags before all players agreed with the score after a round. In the case of individual play, it is common sense to walk together to the other end of the court and assess scoring after tossing. Etiquette also says that you should shake hands before and after a game, and allow your opponent the opportunity to challenge you in a new game in case they lost. Corn hole is a fun and easy game to play all summer long. Perfect for kids and adults alike, it promotes healthy outdoor entertainment and stimulates the competitive spirit of the youngsters. Whether it’s in your backyard or during camping, this game is easy to set up or improvise. Backyard fun, after all, is all about changing and adapting the rules to suit all players involved. And if you really want to play by the rules, you now even know how to do it!